Last week was the first of Spring. Here is California it’s felt like Spring for quite some time but hopefully the rest of country is finally starting to thaw out. Since Spring is officially here that means I’m officially starting the annual purge and organization. 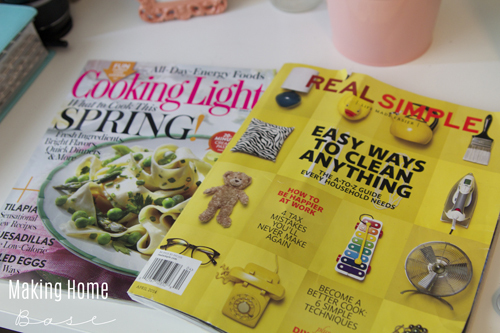 Last week I picked up one of my favorite magazines, Real Simple and got super excited about the household cleaning guide article! After reading through all the awesome cleaning tips I was inspired to get organized! I used their cleaning tip to cleaning jewelry and realized how much of a MESS my jewelry organization has been! 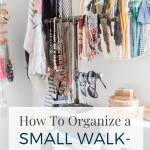 So when in Rome, or when in Spring, ORGANIZE. During nap I sat down with my favorite snack and indulge in some “mama” time. Which included reading these two magazines and drinking a diet coke. Hello relaxation. Do you ever do that? So much awesome inspiration to be found. Delcious recipes perfect for Spring, and tons of cleaning tips also perfect for that Spring deep clean! 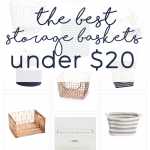 About that DIY jewelry organizer! 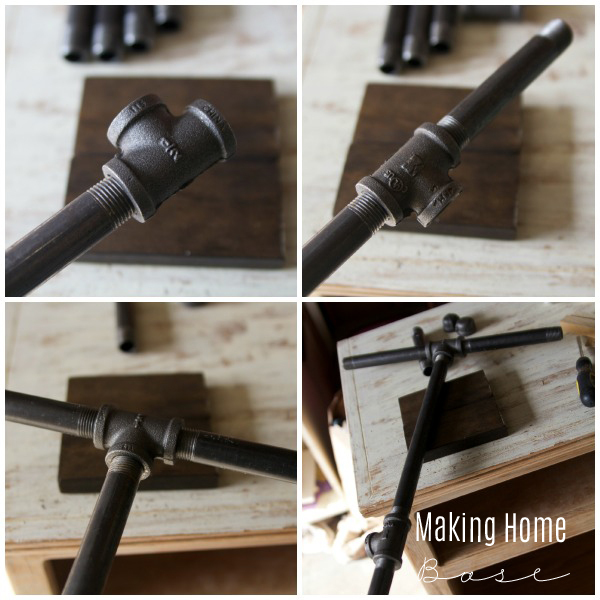 I am loving the look of using industrial pipes in your home. I’ve seen them used as book shelves and tables, and I thought it would be really cute to try it out as a jewelry organizer. It turned out lovely and it’s probably one of my favorite projects ever! Here’s the supplies you’ll need. Please don’t feel like you have to know anything about piping before you start a project like this because I sure don’t. I just went into Lowes and stared at the pipe section for a good 20 minutes and laid every thing out on the floor of the plumbing aisle until I got the look I was going for! A block of wood. I actually used wood I already had and since I didn’t have one single piece large enough I ended up putting two small pieces together making about a 5 inch square. Here’s a little secret. I messed up and you can see that here. When I bought my flange I accidentally purchased a 3/4in flange instead of a 1/2in. I had already spray painted it so I couldn’t exchange it for a 1/2 in. The flange was the most expensive part so I ended up just buying a bushing which connects two pipes that aren’t the same size. It has two size threads. So if you were to get the proper size flange you wouldn’t have that top piece that you see in this picture. Nevertheless, it worked out. 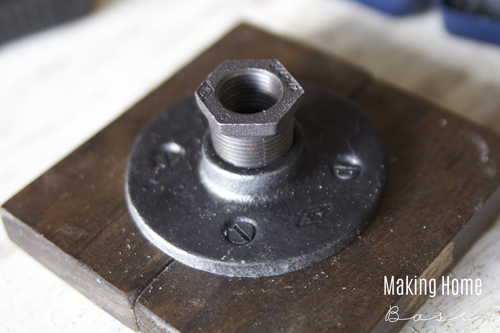 To start building the jewelry organizer I first attached the flange to the wood block with four screws. I ended up also spray painting the screws to match the black flange. Now assembling the pipes. This is really simple. I started from the top with the first tee and attached the two 6in pipes to either side of the tee. Then I connected the largest piece of pipe to the bottom of the tee. This gave me a giant tee. Then I connect the other tee connector to the bottom of the longest pipe. I connected the 5in pipe to it to create the arm for the bracelets. Then I connected the last pipe to end of the tee. Then I connected the whole thing to the flange piece. Lastly I screwed on all the caps to give it a finished look. My explanation is probably way more confusing than the actual assembly. Super easy. The last step was to wipe the whole thing down because the pipes were filthy! My hands were black with an oily film from the pipes so before I added my jewelry I made sure to clean the whole thing really well. 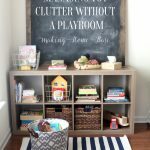 My favorite part of this DIY jewelry organizer is that you can totally customize this all you want. If you want an extra arm for bracelets you can add that. Or if you want it be smaller or larger – it’s totally up to you! It really is absolutely perfect as a jewelry organizer! I can see all of necklaces and bracelets really clearly. 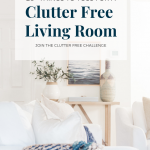 If you are ready to get down and dirty with spring cleaning and organization you have to pick up the April issues of Real Simple and Cooking Light! What’s perfect is that Target is offering a $5 gift card when you purchase BOTH Real Simple and Cooking Light! It’s like getting two for one! AWESOME! LOVE this! i love me some pipe projects! This is amazing, I love the way it turned out! Ohhhhhh I absolutely love love love this!!!! 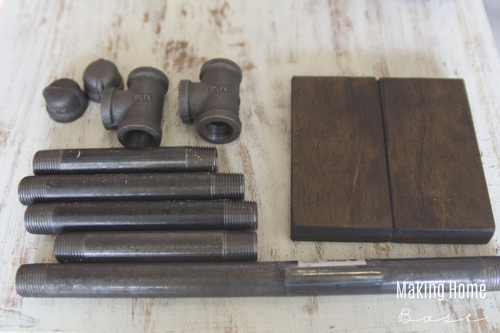 I love industrial with my rustic country cottage style. 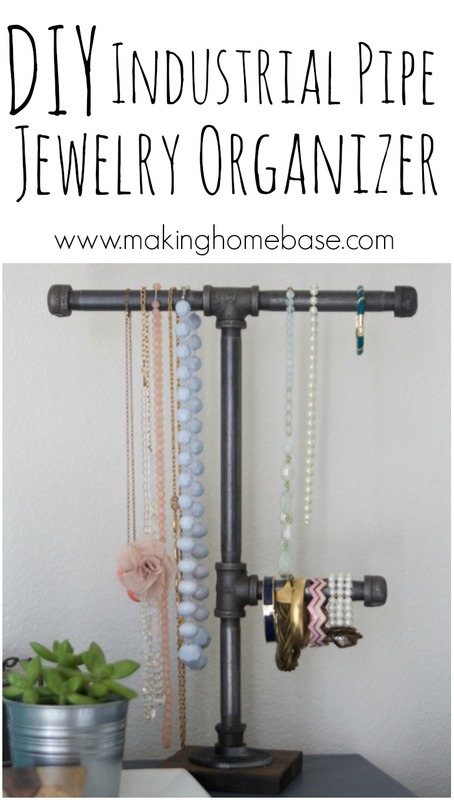 This makes me want to organize my jewelry because it’s a HUGE mess. First, your jewelry is super cute! Second, this is awesome! 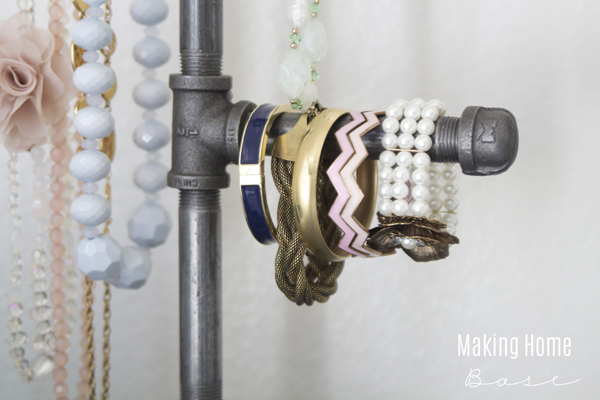 I love the rough industrial look paired with the soft, feminine jewelry. So creative! This is amazing! I totally love it. So industrial and chic at the same time. Great job! LOVE it so much!! Great idea! ooooo what a super neat piece! Isn’t working with pipes the coolest thing ever?! I absolutely LOVE this, Chelsea! What a great idea! Wow! This is so creative! 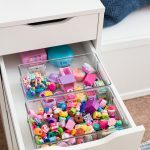 I definitely need one of these in my life so I can stop throwing all of my jewelry into the same box. Great post! This is such a neat idea. Love the industrial look of the metal paired up with the wooden base. What I cute idea. I think I will do this to organize my headbands. Great project. It’s so unique and practical! 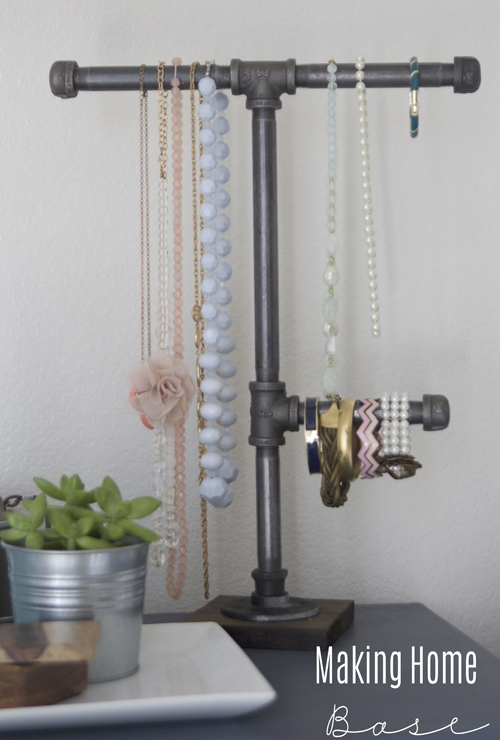 Thank you Ann – it’s such a fun way to display pretty jewelry! Hi! Do yoou know if thwy make any plugins to safeguard against hackers? them and the relationship you have built. Yet, John Delavera insists that list-building is not the secret to a successful Internet business. If you join him, one of the advantages that you’ll have is being able to understand they psychology behind marketing. to live where there are no other road users. Lovely! Can’t wait to make it! Thank You! I am making this for a keychain display for a fall craft show! So excited! That sounds wonderful Maggie! So glad you like it! This is such a cute and clever idea! Pinning! I think PVC would be a better material since it won’t rust, I just gotta make the bottom heavy enough so the organizer could withstand the weight when jewelry is added.